Solid and traditional Canon lens feel. 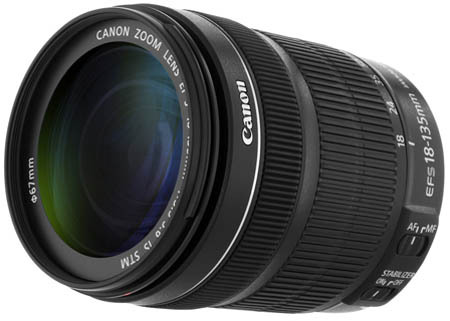 A fantastic everyday standard zoom lens, the new Canon EF-S 18-135mm IS STM is a high quality and affordable lens for Canon dSLR cameras. It is well worth the money whether it is coming with the Rebel T4i kit or as an upgrade or additional lens purchased on its own. Read more in our Full Conclusion. Canon's newly designed EF-S 18-135mm IS STM is slightly smaller that the previous version, with a few improvements as well. They have re-developed the IS system, allowing you 4 full stops of correction. They have also added a video mode called Dynamic IS, which allows the videographer to capture steady videos, even when walking. Continuing with the video improvements, the new AF system includes a stepping motor (STM) that not only features incredibly low vibration, but is also silent. This allows for continuous AF during video capture without hearing the lens focusing. As of now (10/2012), the only EOS camera available with the continuous AF is the T4i. Thankfully this lens is available in a kit configuration with the T4i. As far as stills go, this is also an excellent "all-in-one" lens. Its sharp throughout the aperture and zoom ranges, and is incredibly versatile. It is an outstanding first lens to have with your first dSLR or definitely worth the money if you are looking to upgrade from the standard kit 18-55mm lens.